I had the day off from both work and school, and it has been a nice cool day. Cool as in the temperature cool. This is important because for the last several months, I haven’t been able to knit for more than five minutes before my hands would heat up so much that the combined sweat and movement of knitting started to felt the wool. And if it didn’t start to felt, the wool at least developed that lovely wet sheep smell. Enough to cause me to put down the needles or crank the AC to a subarctic temperature. Today, however, there is no need for the AC. The windows are open and I have been able to finish both of the wrist cuffs and a scarf for my grandma for Christmas. I’m not going to tell the fam about this blog til after that time, since we have a particularly crafty Christmas planned, and I can’t have them looking at pictures here. And I can’t not post. Duh. 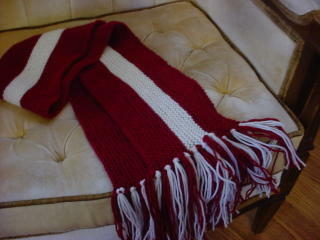 The scarf is knit with Cascade 220 in crimson and cream, which are University of Oklahoma colors. My grandmother, and really, my entire family are crazy about OU football. And though I couldn’t care less about the sport, I think that grandma will enjoy an OU scarf. I knit it up sideways in garter stitch, after seeing a pattern for this style on the Blue Blog, and it took like NO time at all. Who knew that what takes so long to knit a scarf is switching the needles every row? Well, when your row is fifty inches long, you don’t have to switch so much. FANTASTIC quick knit! I hope grandma enjoys her scarf more than she has enjoyed OU’s playing this season. That said, I’ve been interested in going to a high school football game at the high school near our house. I don’t know if it’s because it’s fall and it seems like the thing to do, or because we live in a neighborhood in a house now and it seems like the thing to do to support your neighborhood, but anyway, I think I’ll go to a game next weekend. And if it feels like a waste of time, I can always pull out the knitting during the game. P.S. Pictures of wrist cuffs later tonight. The scarf looks wonderful; Nice, wide, and long. Mm.